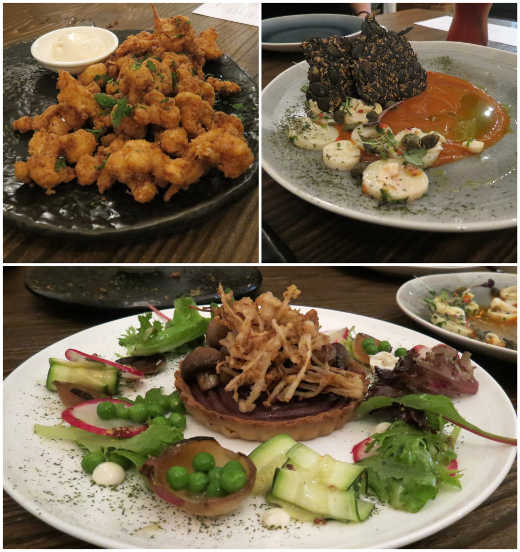 We followed up our morning visit to Particle with an evening trip to another of the many new vegan places popping up around Melbourne, Billy and Lucy. It's a block across from Fitzroy's heaving veg*n Brunswick street strip in a building that's seen a few restaurants come and go over the years. The fit out is simple but pleasant - lots of exposed brick, an open fire and a few fancy chandeliers. The whole place is vegan and is aiming for something a bit fancy, like a low-key Transformer. 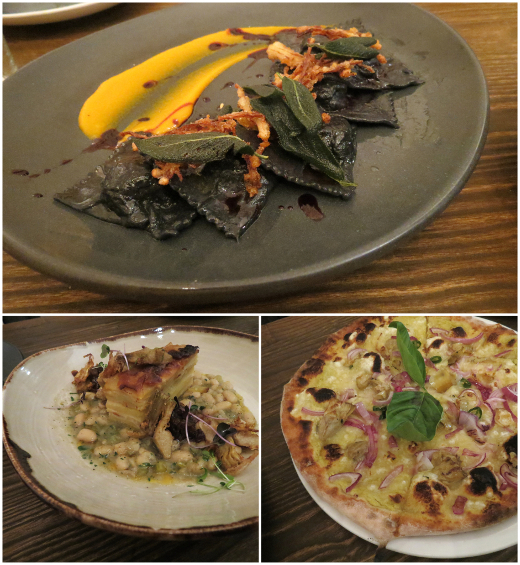 There's a bunch of wood-fired pizzas as well as a mix of entrees and mains with a European vibe. We were with a couple of friends who were keen to share, so we got to sample widely. We kicked off with three starters: southern fried cauliflower florets ($8), palm heart ceviche with capers, black seed crackers and smoked tomato emulsion ($14) and roasted mushrooms in an olive oil tahini crust tart with currant pate, bbq pickled onions, salad and aioli ($15). This was such an impressive start - the mushroom tart in particular blew us all away, combining a subtly sweet currant pate with the mix of roasted mushrooms really worked. The other two dishes were great too and had us all excited for the mains to come. We shared a couple of mains and a pizza - the mushroom and fig charcoal ravioli with vincotto and carrot puree ($25), the potato dauphinoise with parsnip, crispy artichoke hearts, onion jam and garlic cannelini ragout ($25) and the special pizza (house made artichoke puree base, cheese, artichoke, red onion and fresh chilli, $23). This was another set of complete winners. The dauphinoise was probably the best standalone meal, in that it combined a few more elements than the ravioli, but in a sharing situation I think the pasta outshone it. The pizza was great too, reminding me a little bit of the Gigi pizza that uses a cauliflower puree base. I'm not sure which vegan cheese they're using, but it was nice and melty and we didn't feel like we were missing out on much. 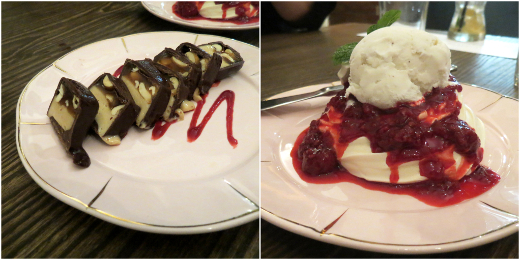 We deliberately paced ourselves to leave room for dessert, splitting the snickers bar ($9) and the pavlova nest with berries and ice cream ($13). I preferred the snickers of the two, although that mostly just reflects my ambivalence about pavlova. The desserts probably lacked a bit of the finesse of the savouries, but they both hit the spot. The food at Billy and Lucy is really great and it's got a nice vibe too. The only downside on our visit was some pretty distracted service - hopefully just some early issues that they'll iron out as they keep going. We'll definitely be back to find out. messy veggies are the only other blog to have reviewed Billy and Lucy so far - they loved it. Accessibility: There's a small step up on entry and a fairly spacious interior. We ordered at our table and paid at a high counter. We didn't visit the toilets. wow that looks amazing - definitely one to include on my list to try! Oooh! Those southern fried cauliflower florets look so good! WANT!